I'm an old rocker guy, which is something I am well aware of, but I'm also the most open-minded listener that I know. 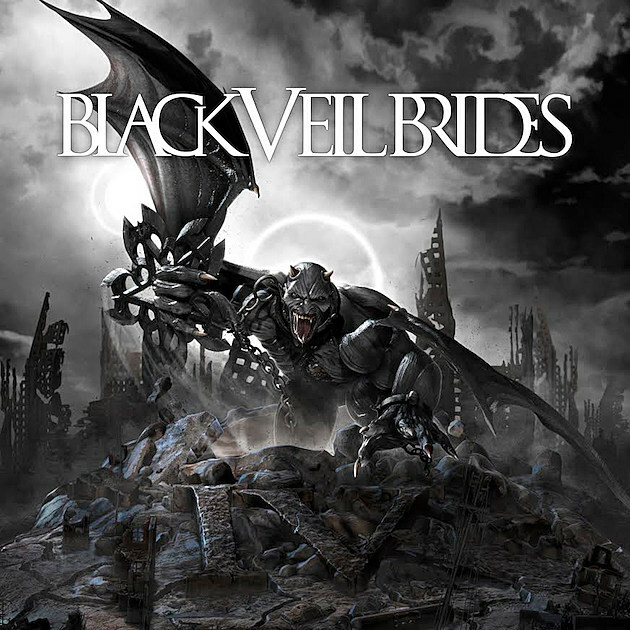 So why did I cringe when my son asked me if I had heard of Black Veil Brides and listened to their latest release? He gave me a short review of "it's pretty good," and his is an opinion that I highly respect. I had heard of the band, and was familiar with their image, which had me writing them off as one of the wannabes that I didn't have time for. Looking like some kind of goth circus clowns from a post-apocalyptic Ringling Brothers production and often mentioned in the same breath as bands like Escape The Fate or Falling In Reverse, I expected to be disappointed. I was ready to hear a screamer or a young punk with a whiny voice and a guitarist that would mutilate one chord (the same one) in every song. The last thing I wanted to hear was another band like Escape The Fate or Falling In Reverse. I have a huge buffet of music to eat from, and these bands are just not my cup of tea. But, it turns out that this is a tasty platter of new hard rock with plenty of melody, sharp guitar solos, and a surprisingly masculine vocal performance. Let's start by telling you that this is a Bob Rock production. You may hate him, you may love him, but it's hard to deny his influence on whatever he produces. This sounds like a Bob Rock production. There are points of harsh impact ("Stolen Omen"), and there are delicate and uplifting points as well ("Walk Away"). One of the best things about this production is the inclusion of some piano and string arrangements and some female backing vocals to add to the already solid harmonies. These are finely crafted songs that have great melody and some more "mature" elements that set the band apart from their image. I want to start off by telling you about the last song on the album because I think you'll officially write me off as a complete nut job when you hear what I was reminded of. "Crown Of Thorns" is a song that starts off with a dual harmony guitar part and escalates to a chorus with a feel that reminded this listener of something you might get from the 80's Scottish band Big Country. Their sound or style isn't the same, but the cadence of the chorus gives the song that certain feel. I personally found this to be a huge and welcome surprise, and definitely not what I expected to hear. I'm sure I'm the only one who will hear the similarities because let's face it, if you're listening to Black Veil Brides you have no idea who the hell Big Country is. This song told me that I was dealing with a band whose sound goes deeper than many of its peers. "Drag Me To The Grave" has some elements of that immature or adolescent sound I so loathe, but they even pull this one off fairly well. "Stolen Omen" has some cliche growling death metal vocal elements, but they are few and they come accompanied by a great melody so it's all good. "Devil In The Mirror" is probably the closest thing to what I expected to hear from the band. The grinding guitar, the full on vocals, the chanting, drums going rapid fire - the things that every high school band has. The difference that sets Black Veil Brides apart from the rest is their knowledge of song structure and their respect of the melody. Even though "Devil In The Mirror" isn't my favorite track on the record, they make it worth listening to because of their ability to convincingly carry the hook through the song. "Goodbye Agony" is the best example of this band's patience and respect of melody. The huge layered chorus with a perfect melodic guitar part playing gently behind it all is chilling. The simplicity of "Last Rites" and the vocal layering and arrangement make it one of the more appealing songs on the record, and the killer guitar solo gives it a helping hand as well. The guitar work throughout this record is very very impressive, with complex runs and tight melodic solos. "Walk Away" would be considered the ballad of the album with its piano and string arrangement combining with a big vocally layered chorus. It's a lush masterpiece that contains one of the best guitar solos I've heard in the past 10 years. It will remind you of Guns N' Roses' "November Rain," and that's okay. The buildup to the solo, the piano part, and the solo itself are eerily similar, but it's all done extremely well. The impressive singles from the album are all packed into the beginning of the tracklisting, but I find the rest of the album just as strong. Kicking off with "Heart Of Fire" and "Faithless" is an excellent way to be introduced to this band, though. Two catchy songs with a youthful energy, but there are no cheap thrills here. All the music is played tight in some fairly complex structures. Shame on me for rushing past a band because of age, a little bit of Maybelline (okay, a lot), and the company in which they keep. Whether we want to or not, we get pre-conceived thoughts about what something is going to sound like, especially when we are supplied with an image. I think we judge a band by the box they've been thrown into, too. Putting puppies in a biscuit tin doesn't make them biscuits. I think the trick is learning to slow down and take in each piece of music, and most of all, let it do the talking. Black Veil Brides music has spoken to me and I'm really glad I listened.